Over the centuries London’s ground surface has risen inexorably and as a result Roman streets and buildings lie buried up to 7m below the modern street level. This map, created by Museum of London Archaeology, graphically presents our most up-to-date knowledge of a lost world: the Roman city’s topography, plan and appearance, including its roads, waterfronts, public buildings, houses and defences. 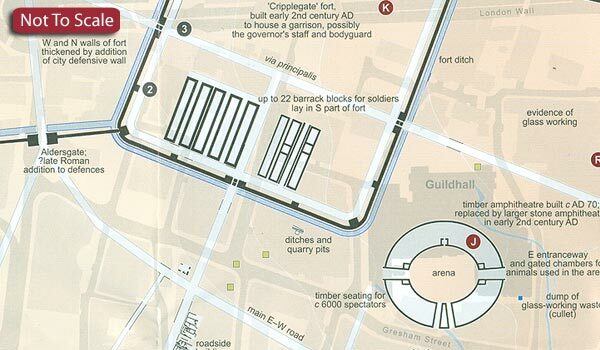 Roman remains are accurately located and superimposed on the modern street plan, with visible features indicated. The accompanying guide, on the reverse of the printed map, provides a descriptive history of Londinium and illustrations of important sites and finds, many of which can be seen in the Museum of London galleries. A real gem of a map, this is yet another way to discover even more about one of the world's greatest cities.